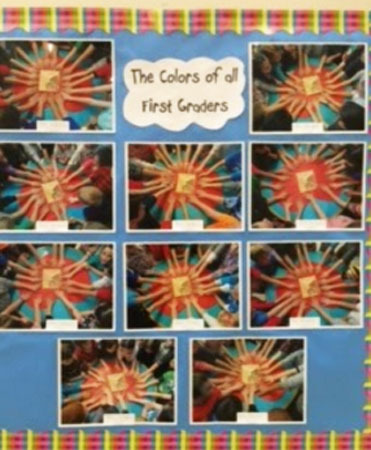 This month at the Forestdale School each First Grade Classroom read the book, The Colors of Us, by Karen Katz. The book celebrates differences and similarities that connect all people. The story is about a seven year old girl named Lena who wants to paint a picture of herself. As she talks to her artist mother about drawing her portrait, she tells her she will paint herself brown. Her mom explains that there are many shades of brown. Together they take a walk through the neighborhood, and her mother shows her the various shades of brown by looking at all the people they know. She compares them to the colors of food such as; coconut, honey, coffee, ginger, and cinnamon. The book talks about the colors of skin in a positive way and shares how we are all beautiful because we are different.